This is a richly illustrated talk about the basis of perception. What is a picture in vision and touch? Kennedy will offer new theories of figure-ground in cave art, depth perception from Renaissance perspective, and communication via unrealistic representation. Common features in pictures by the sighted and the blind (Esref & EW) tell us about 6 kinds of figure-ground surface edges, a principle evident in cave art. In touch as well as vision these edges are perceived from a vantage point — so Renaissance linear perspective applies to the visible and the tactile environment. Showing the environment unrealistically is a way of creating pictorial metaphors. Blind and sighted artists depict impressions and thoughts metaphorically. Kennedy will present 8 ways to structure visual input, offer a new theory of Gestalt grouping and discuss recent experiments on illusions and perception of direction. 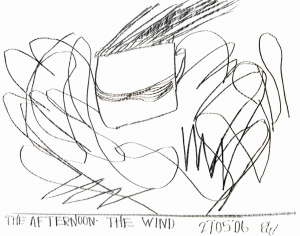 The afternoon, the wind, May 27 2006, by EW. The lines around the cup stand for thoughts and the bottom middle zigzags for sighs. Short Bio: John M Kennedy, perception psychologist, born in Belfast, PhD Cornell with a thesis on outline drawings, is the author of Drawing and the Blind and of Psychology of Picture Perception.